Josh was a lovely black Greyhound. 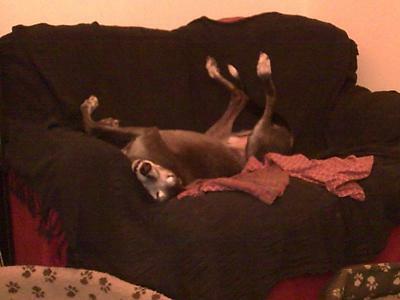 He came to us from the Retired Greyhound Trust as a foster when he was returned to the kennels for being just too scared. He was so frightened the day they brought him to our house that he peed himself on the doorstep in abject fear. Our other Greyhounds loved him and made him feel part of the pack. Josh loved to run up and down the garden and roo roo roo at the neighbours. He was always timid and afraid of men visitors but he was happy in his own little way. After 6 months we decided to adopt him so he would never have to leave us. It took him a whole year to find the courage to climb onto the sofa. Last December, after being with us for 3 and a half years, he became ill with a mystery virus. He had a stay at the vets where they put him on a drip and gave him antibiotics but could not make him well. They sent him home with not much hope of a recovery. I slept downstairs with him, giving him Reiki healing and doing Tellington TTouch circles on him and feeding him antibiotics and painkillers in raw vegetable soup and he seemed to perk up just in time for Christmas. He was able to eat a cows ear and liver cake on Christmas day but a couple of days later I saw a beautiful rainbow over our garden and I knew that it had come to take Josh over the bridge. By December 30th he had deteriorated and we had to rush him to the vets surgery where they diagnosed multiple organ failure and we had to let him go. What a lovely story, and look at that wonderful picture of your precious Josh. He is the image of a happy, contented, trusting dog. He must have been so comfortable in your home that he was able to completely expose himself that way...tummy up, anything goes...sleeping peacefully! How heart breaking it is to lose a friend like this, but the good thing is, that dogs are so able to live in the present moment that we can learn from them, the value of now. They are truly our teachers and mentors. What would life be without them? Bless your heart for giving a wonderful dog like Josh a good home. He obviously loved it there...and I know there are comfy sofas over the Rainbow Bridge.